The Minnesota chapter of the Public Relations Society of America (PRSA) announces its new leadership for 2015. 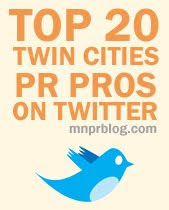 Minnesota PRSA is the ninth largest chapter of PRSA, the world’s leading organization for public relations professionals. Led by President, Joel Swanson, APR, President of Risdall PR, Minnesota PRSA is comprised of more than 400 corporate, agency, independent, non-profit and government public relations professionals from Minnesota, the Dakotas and Western Wisconsin. Through its programs and services, Minnesota PRSA delivers on its mission of engaging members at every stage of their careers with the knowledge, resources and connections to achieve professional excellence, drive ethical and strategic outcomes, and advocate for the profession.